So as time went on Sara went thru test after test, bloodwork after bloodwork...poking and prodding galore. No explanation could be found for her seizures... and Sara's were being very difficult to get under control. I hated that she had IV after IV and couldn't get any real nourishment; not to mention that she was black & blue from head to toe because of all the IV tries. They kept failing due to her veins collapsing. And the fact that she was mostly knocked out and we were losing precious time for development... but that was a double edged sword because seizures were preventing her from developing and if we couldn't get those under control we weren't going to get anywhere... so, people always say that sleeping allows us to heal in more ways than one, so sleep she did... but it was forced with all the drugs that she was on. Sara did finally get a PIC line in which was a blessing and I yelled at the ICU doc when I came back up from trying to eat something the one day & they wouldn't let me in to see her as they were trying to get yet another IV in to her...when I finally got in and saw how black & blue she was from all the needle marks I had had enough. I about flew off the handle and said that was it -- I could take no more. They were treating my beautiful baby girl like a pin cushion. That's when someone finally had the idea to do a PIC. Why noone thought of it before I'll never know... but it made me soooooo mad I could have choked someone... to think we could have saved Sara a lot of pain and stress over that... unreal. Sara was started on Phenobarbital at first, then moved to Trileptal and then Topamax... I think that's the order... it was so long ago and she was on so much it's hard to remember what came when. She was also on Ativan to help her sleep at night. 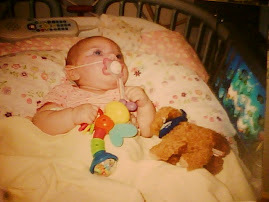 It finally came time when the doctors wanted to send us home; we couldn't stay in the ICU units any longer as they didn't feel Sara was critical enough to keep there and they needed the bed space for others more in need. I understood but at the same time I was so nervous because I had become accustomed to the care in the ICU units (just the idea that she was in open view of everyone and could be seen). We were moved to a regular room in preparation to go home. In that time I had to make another decision...whether or not to get Sara a G-tube for feeding. She was taking some food by bottle again during her awake periods which was good because she hadn't lost her sucking ability. She enjoyed her binky quite a bit in the ICU and I was thankful for that. So, I pretty much had to make the decision on my own, and I knew it would be best for her to do it because I wanted to be able to get her the nourishment she needed and also her meds could be put in thru that. I was a wreck at the idea of my baby girl being sedated and put under the knife so to speak. I mean, this would be her first surgery. I couldn't get over how completely sick I was over this whole entire thing. The day came...surgery. The anasthesia team talked to me about what they were going to do, and the doctor talked to me about the procedure and then it was time to take her back. I didn't want to let go of her... I just kept holding onto her little fingers... the guy that was going to do the anasthesia looked at me and just said "don't worry, we'll take good care of her". I looked at him and just started to cry more but shook my head as if to say "ok", and I let her go. The time waiting for her to get done was completely agonizing. I was there alone which made it worse. It was a long surgery... 5 plus hours. A time came when I started to get really worried because I was becoming one of the last to be in the waiting room and I started to wonder if they knew where I was, did they remember that I was here waiting?? Then finally, the call came. She was done. Sara made it thru the surgery fine. I was able to see her in recovery. I was a bit shocked as to how big the g-tube was. I was kinda led to believe that it would be flush with the skin. It was not. It scared me at first, and yes, I cried some more once I saw it and looked at my beautiful little girl laying there sleeping and thinking of all she'd been thru so far in her little life. I didn't think it possible to hurt so much. My husband & I waited to have a child. When one of us wanted to try, the other wasn't sure & we went back & forth for a while. Then one day, we thought we'd try and our sweet Sara was born on March 24, 2007. She was actually due on St. Patricks Day but she must have decided she didn't want to be green :) She was what I prayed for... the light of my life. 10 fingers, 10 toes, perfect & beautiful. I couldn't have been happier. Little did we know we were in for one heck of a road. Sara was fine for the first 2 months of her life. When she was born, her APGAR scores were 8's & 9's. She passed her hearing test... all looked good. At 2 months of age Sara had one day that she spent "scaring" herself... the entire day. I didn't know what was going on. I called the doctor & he said "put her on her tummy, they can't scare themselves on their tummies". "OK" I thought, and that's what I did. Sara sacked out & slept for a few hours. I was like, well that worked! A couple weeks later, on Memorial Day of '07, she did it again... half the day she spent constantly scaring herself. We had a pediatrician appt the next day... that was when her doctor thought she was having seizures. Right then our world came crashing down. Within a couple of days we had an appointment at Children's Hospital for an EEG to see what was going on in Sara's little brain. Results confirmed our worst fears. Sara had been diagnosed with Infantile Spasms (or West Syndrome). I didn't know what to do except cry...and cry....and cry some more. She was admitted to the hospital that day and further tests were done...MRI, CAT Scan, bloodwork... the MRI showed her brain was not growing. The spasms are very hard on the brain & would not allow her to grow & develop normally. Her first neurologist told us that Sara would never walk, talk, go to a regular school, be able to dress herself... I was blown away and again all I could do was cry. We then were introduced to another neurologist who gave us atleast a slim chance at some hope that we could get the spasms under control and hopefully start to see some improvement in her development; but the likelihood of more seizures taking over after the spasms was very high... it seems with the Infantile Spasms that kids often go from one seizure type to the next throughout their lives... at least, statistically speaking. So, we decided to go with the 2nd neurologist to follow Sara's care and told the first that if he ever came near our daughter again he'd be sued. How dare he tell us those things about our daughter? How could he know. This is when mommy started to get tough and the tough got going!! Options for medicine were discussed. There are only 2 that work the best for the spasms. Vigabatrin (which comes out of Canada) and ACTH (a drug that must be given as injection). We took the lesser of the 2 evils 1st and went with Vigabatrin. After a short time I thought it was working...on the outside Sara was becoming more "normal" and she even started to smile a little. But, when we went for a follow up EEG it showed little improvement on the inside. I never will understand that...how she could look so good on the outside but still be a mess on the inside? That didn't make sense to me at all. So, the ACTH had to come in. That was tough. I could not bring myself to give Sara an injection each day. Thankfully my mother-in-law was a nurse so she did it. Sara had a reaction to the medicine that we were sent home with, & it put us back in the hospital for a couple days. We thought it was a bad vial, but noone would help us look in to that. It happened twice and thankfully by that point we were ready to come off it because it had worked -- within 2 weeks it had taken away her spasms. However, shortly before we were completely weaned off the ACTH, new seizures started. These caused her to stop breathing & Sara would literally turn blue. My heart stopped & we rushed her to Children's ER. 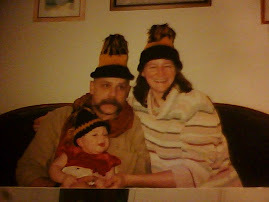 There started our last hospitalization to this day but it was a 3 month stay with nearly all of it spent in ICU Units.. We were in from July - Oct '07 and it was miserable. Her seizures were horrible & she would have them in frequent clusters. They were determined to be Complex Partials & they were coming from both sides of her brain... was it good the spasms were gone? I didn't know which were worse at this point and my world was spinning so fast I didn't know which end was up. My life had stopped & I was living at the hospital.